Senior OL Michael Tucker (Pottstown, PA / Pottstown) was selected to play for Team Stars & Stripes in the third annual Tazon de Estrellas (Bowl of Stars) football game. He joined 52 other Division III players in the postseason game against the CONADIP All-Stars from Mexico. Senior DB Scott Sullivan (Coatesville, PA / Coatesville) was the lone Red Devil named to the All-Centennial first team. He was tied for 13th nationally with six interceptions. Dickinson finished below .500 for the second straight season for the first time since 1985-86. 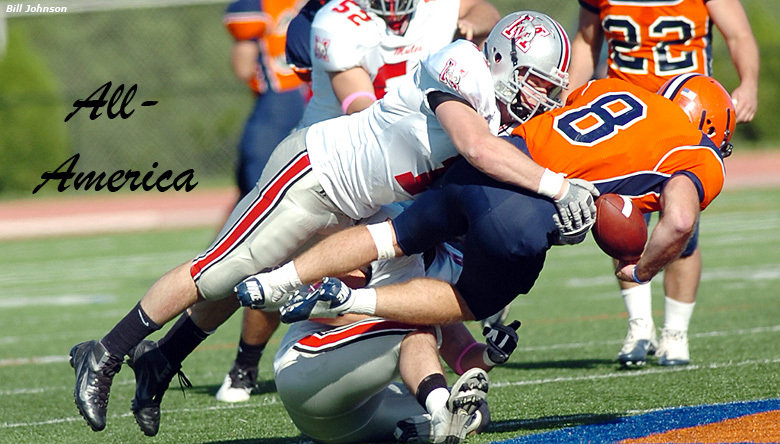 Senior RB John Kaschak (Lake Hopatcong, NJ / Jefferson Twp.) finished his career second all-time among Diplomat RBs with 2,384 yards. Senior QB John Harrison (Flourtown, PA / La Salle College HS) closed his stellar career with F&M marks for attempts (1,298), completions (856), yards (8,886), touchdowns (87) and completion percentage (65.9). Senior DE C.T. Marsh (Phoenix, MD / Loyola-Blakefield) became the school's all-time sack leader (26). The Diplomats did not have a first-team All-CC selection for just the second time in the Conference's 29-year history. Gettysburg registered its first back-to-back winning seasons since 1994-95 and have now won 11 of their last 16 games. The Bullets were 11th nationally in total offense, averaging 460.9 yards per game. Junior QB Kody Smith (Medford, NJ / Shawnee) was 17th in Division III in passing efficiency (152.12), while sophomore WR Aden Twer (Jenkintown, PA / Jenkintown) was 17th in receiving yards per game (107.9). Junior LB Larry DelViscio (Springfield, PA / Msgr. Bonner) was named to the CoSIDA Academic All-America second team. Junior TB Ted Delia (Lebanon, NJ / North Hunterdon) was named to the D3football.com All-South Region second team as a return specialist after averaging 25.9 yards per punt return with three TDs. He also finished the season with 1,072 rushing yards, making him the 18th Bullet back to reach 1,000 in a season. Johns Hopkins closed its season with a 23-12 loss to St. John Fisher in the first round of the NCAA tournament. The Blue Jays finished with a pair of top-20 national rankings at No. 18 by D3football.com and No. 19 by the AFCA. Hopkins spent the last nine weeks of the season ranked in the AFCA top 20, the longest such streak in school history. Head coach Jim Margraff was named the AFCA Region 2 Coach of the Year for Division III. Senior QB Hewitt Tomlin (Jackson, TN / Trinity Christian) finished the season ranked 15th in D-III in total offense (298.33) and 16th in passing efficiency (152.57). Sophomore WR Dan Wodicka (West Lafayette, IN / West Lafayette) was 10th in receptions per game (7.91) and 11th in yards per contests (113.18). The Jays were second nationally in total offense (492.73) and 10th in total defense (244.27). Senior DL Jason Marquis (Jeannette, PA / Jeannette) and sophomore LB Kevin Gorman (Waverly, NY / Waverly Central) were named to the All-Centennial second team. Marquis closed his career with 196 tackles, including 21.0 for loss. Freshman Nicholas Stubbs (Hagerstown, MD / South Hagerstown) scored a touchdown in five different ways in 2011 - rushing, receiving, a punt return, a kickoff return and an interception return. The Eagles were 238th out of 239 teams in Division III in total offense, averaging just 177.5 yards per game. Juniata ended a 21-game losing streak with a thrilling 17-16 win over Susquehanna to capture the Goal Post trophy. McDaniel head coach Tim Keating resigned his position after 19 seasons on The Hill. Offensive coordinator Aaron Bartolain '01 has been named interim head coach. Senior TE Woody Butler (Smithsburg, MD / Middletown) played in the All-American Bowl in Minneapolis. Sophomore RB Joe Rollins (Temple Hills, MD / Surrattsville) finished the season ranked ninth in Division III in rushing, averaging 140.1 yards per game. He was also 11th in all-purpose yardage (174.40). Rollins and senior DL Sam Cox (Towson, MD / Towson) were named to the D3football.com All-South Region team. Cox was tied for 17th in D-III in sacks (0.9 per game). Senior DL Allen Petros (Bethlehem, PA / Liberty) was named first-team All-South Region and third-team All-America by D3football.com. He set a school record with 63.5 tackles for loss in his career. Petros represented the 'Hounds in the D3 Senior Classic in Virginia. Moravian was 232nd out of 239 teams in Division III in total offense (214.4). Senior LB Pat McDonough (Wyomissing, PA / Wilson) closed out his career with selections to three All-America teams. He was a first-team AFCA choice - the first Mule to receive the honor since 2002. McDonough also earned second-team recognition for the Associated Press Little All-America team and third-team honors from D3football.com. McDonough is the first Muhlenberg player to reach triple digits in tackles in back-to-back seasons and closed his career with 333 stops. Senior DB Chris Hartzell (Sinking Spring, PA / Wilson) finished his career second all-time in kickoff return yards (1,220) at the school. The Mules were ninth nationally in scoring defense (12.8) in Division III. Susquehanna senior TE Matt Knouse (Elliottsburg, PA / West Perry) was selected to play in the Tazon de Estrellas (Bowl of the Stars) game in Mexico. He was named first-team All-Centennial along with Senior RB Greg Tellish (Mount Airy, MD / South Carroll), LB Trevor Terpening (Mount Airy, MD / South Carroll) and PK Spencer Hotaling (Selinsgrove, PA / Selinsgrove). P Taylor Morton (Elkton, MD / Salesianum School, DE) finished tied for 22nd in Division III in punting (39.21). The 16 wins over the last three seasons is the most by Susquehanna since capturing 16 from 2000-02. Senior DB Shane Eachus (Aston, PA / Garnet Valley) became the first Bear to earn first-team Academic All-America honors since Chuck Odgers in 1986 and 1987. Senior LB Greg Martell (Levittown, PA / Neshaminy) is the first Ursinus player to earn Centennial Defensive Player of the Year honors. Senior Al Desiderio (Philadelphia, PA / Roman Catholic) helped the Bears finish in the top 10 nationally in kickoff (7th) and punt (10th) returns. He was sixth in both categories, averaging 29.62 yards on kicks and 17.54 yards on punts. Ursinus posted a third consecutive winning season for the first time since 1999-2000-2001.